UCF women's basketball players watching the ESPN Women's Selection Special Monday night at 7 p.m. The No. 12 seed Knights will face the No. 5 Arizona State University Sun Devils on Friday in Coral Gables. What’s better than eating pizza? 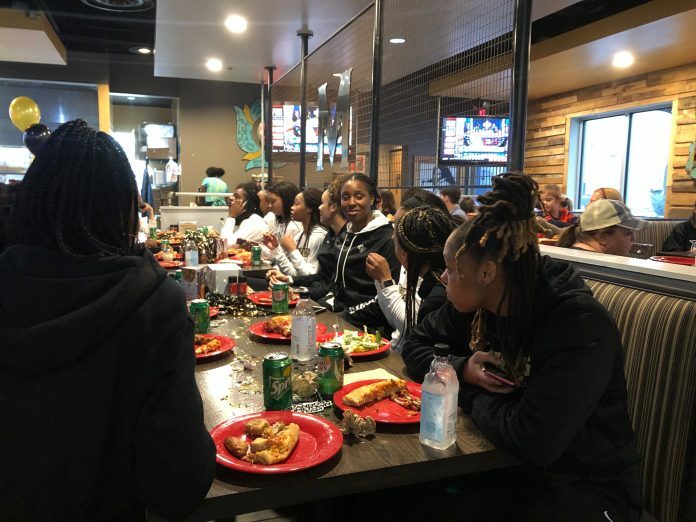 Eating pizza with UCF women’s basketball players, coaches and fans to celebrate the program’s first-ever at-large berth to the 2019 NCAA March Madness tournament. The Knights were placed as the No. 12-seed in the Portland Region and will face the No. 5 Arizona State University Sun Devils in Coral Gables on Friday. Friends, fans and family joined the team at Mellow Mushroom on Monday night for a pizza party to celebrate the news. The Knights are looking to show that they belong on the big stage. The bracket was revealed on ESPN by mistake on Monday afternoon just hours before it was scheduled to be broadcast on the Women’s Selection Special at 7 p.m. ESPN released a statement apologizing for the mishap and announced the bracket would be revealed at 5 p.m. instead of its original slot time. Wright and redshirt senior guard Nyala Shuler said they were both taking naps when the bracket was leaked. They were woken up by phone calls instructing them to meet the team in 15 minutes. Shuler wanted the selection to be a surprise, though. Knights fans and families will be able to experience this moment, too, without having to travel very far. The first round of the tournament will be played in Miami, which gives the team a “home court advantage,” according to Wright. Shuler said her family was already making hotel arrangements to go to the game. UCF set the program record for the most victories in a single season at 26-6 in addition to receiving votes in the Women’s Basketball Coaches Association poll for 19 weeks in a row. The Knights have appeared in five NCAA tournaments since becoming a Division I program, with the latest being in 2011. Each of their previous appearances came as a result of automatic berths from winning their conference tournaments, with two in the Atlantic Sun Conference (1996 and 1999) and two in Conference USA (2009 and 2011). Wright said she grew up watching these tournaments with her dad. “I always dreamed of playing in [the tournament] not knowing the time would come so soon,” Wright said.